Theo enjoys celebrating her birthday by taking a day trip somewhere sun might possibly be found. Since her birthday is October 4 and we live in Oregon you can imagine how much of a challenge this can be. This year the best shot was to go inland so Theo selected Hood River as our destination. So we packed dog, food, and ourselves into the Jeep and headed off for a day wine tasting. Before I say anything about wineries I should mention that the day was a success as we did find an adequate amount of sun and enjoyed ourselves immensely. 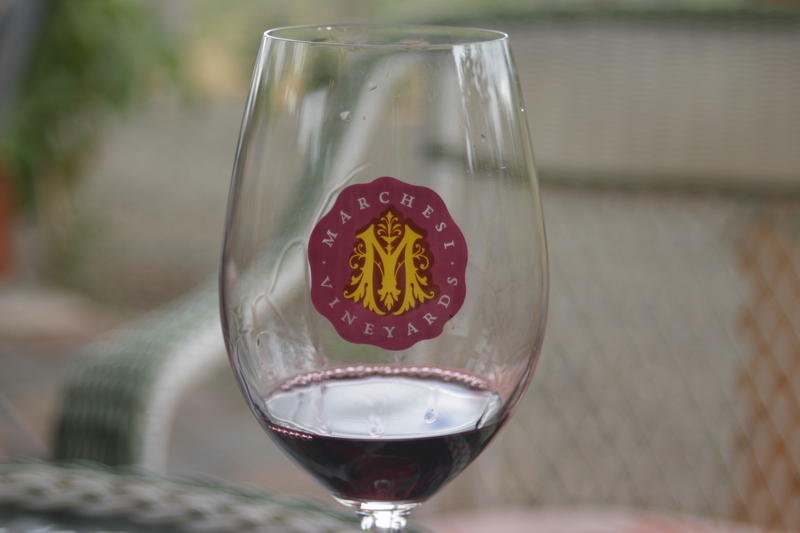 We visited five wineries: Marchesi Vineyards, Phelps Creek Vineyards, Pleasant Valley Vineyard & Winery, Mt. 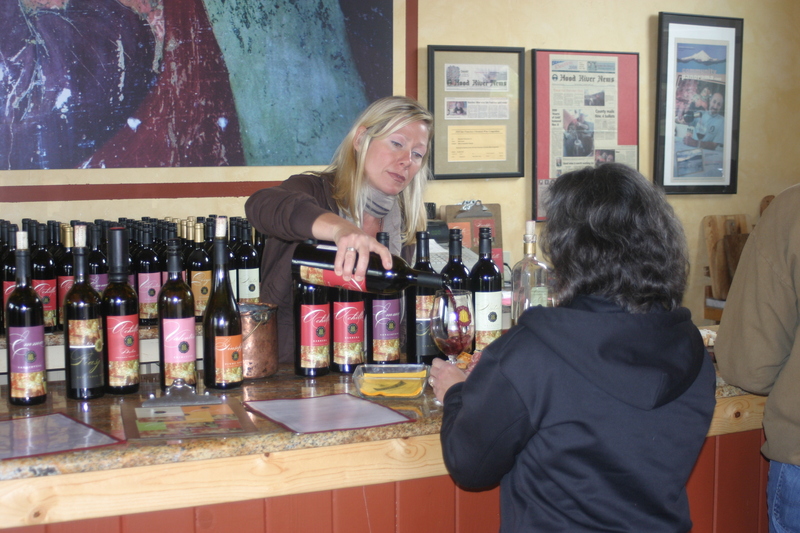 Hood Winery, Viento Wines, and Wy’ East Vineyards (listed in the order visited). Marchesi was the only winery we had visited previously and was on the list at Theo’s request. My lovely wife made a great call! 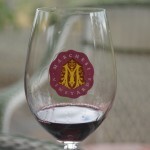 I first heard about Marchesi Vineyards when I visited Cathedral Ridge Winery, also in Hood River, a couple years ago. I had time for one more stop before heading home and they recommended Marchesi. I was not disappointed! Marchesi specializes in Italian varietals and they make their wines with true passion. Winemaker Franco Marchesi is a native of Italy where he learned to create his wines the “Italian way” yet has lived and worked the wine industry in the United States (California and Oregon) long enough for his wines to express wonderful characteristics emerging from both cultures. There are a few other wineries in the region that do Italian varietals but the wines produced by Marchesi tantalize the pallet with clear expression of the varietal fruit then finish with nearly perfect acidity (which I greatly value in a wine). You can find wines at Marchesi for just about any occasion ranging from the lighter Natal Dolcetto (current vintage 2009) to the more fruity Achille Barbera (tasted both the 2007 and 2009). 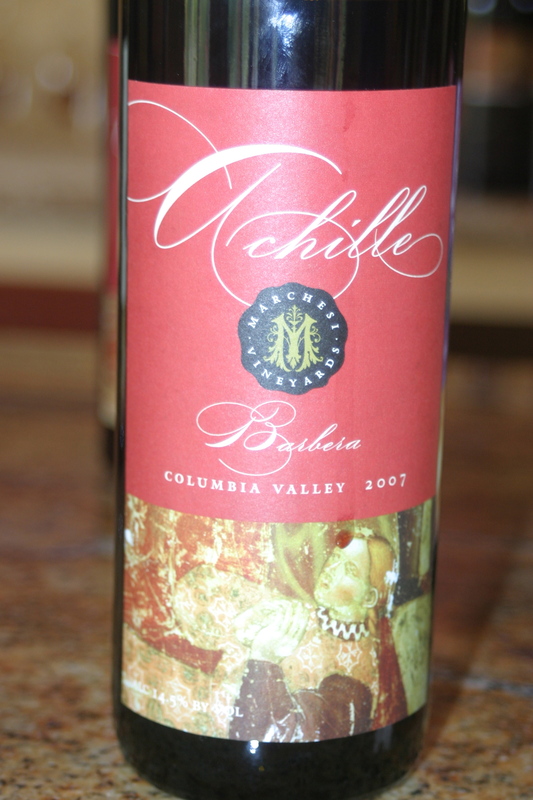 We tasted several wines but the star of the show for me was the 2007 Achille Barbera (named for Franco Marchesi’s grandfather). This wine was as close to the “perfect” Barbera as I have ever come. 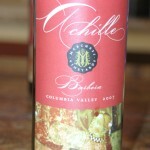 What was even more surprising about this wine was that I believe this wine was the first produced from young vines. As good as the Marchesi wines are after tasting you will be shocked to find that only one of their wines, their Piasj Red Table Wine (Cabernet Sauvignon, Merlot, Syrah) is priced over $30! For me wine tasting is really a wholistic experience (as you have probably gathered if you have read my previous posts). I need to enjoy the people and the atmosphere as much as the wine. 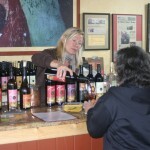 My enjoyment of my visit to a tasting room has as much to do with my wine purchases as the quality of the wine itself. Marchesi does not disappoint in this area either. 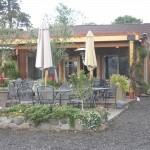 The tasting room is small but has outdoor seating where you will be serviced as if you were standing at their counter. What was really cool was that it started to sprinkle a bit and Franco Marchesi himself came outside and opened large umbrellas over the tables himself to keep his visitors dry. He also delivered to our table a large plate of freshly cut bread and salami to enjoy with our wine. What is not to like about this? This seems really European….and wonderful….to me. Even though they were a bit busy Franco and his tasting-room staff took time to converse with us, learn a bit about us, and treated us as old friends. I’ve been to Marchesi three times and have been treated this way all three times so I assume this is simply the way that they do business. If I had room in my budget for another wine club it would likely be Marchesi’s. Don’t think I will ever tire of visiting them. If you are anywhere near Hood River it will certainly be worth your time to stop by and experience them for yourself. Natalie’s Estate, located at the foot of Chehalem Mt. just outside of Newberg, OR was open yesterday so Theo and I, and our friends Kathy and Fred, decided to pay them a visit. We always look forward to going to Natalie’s because they are not open often and it is a treat to taste their exceptional wines. Yesterday’s tasting lineup was especially good. 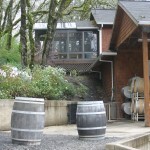 It included the Whistling Ridge Pinot Noir (Chehalem Mountain), Zinfandel (Columbia Valley), Pines Vineyard Merlot (Columbia Valley), Elephant Mountain Syrah (Columbia Valley), and the Elephant Mountain Cabernet Sauvignon. Each and every offering was absolutely delicious! I am always amazed at how winemaker/owner Boyd Teegarden is able to get quality flavor from what most would consider young wines. For example the Elephant Mountain Cabernet Sauvignon is a 2009. If you tasted it blind you would never guess it was that young because it it incredibly full flavored and is not characterized by over-the-top tannins characteristic of young cabernet sauvignons that I have tasted in California. Particularly noteworthy yesterday was the Elephant Mountain Syrah. I am a syrah lover through and through and this was a WOW wine for me. I’ve had Natalie’s syrahs before but this in my view was the best ever. If you like light-style syrahs perhaps this won’t be for you but if you like what I enjoy calling “chewy” syrahs this will knock your socks off. 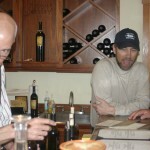 When you drink Boyd’s wines you discover quickly that he does not like to hide the fruit in his wine. This syrah blasts you with great fruit yet treats the back pallet to a balanced finish that allows the wine to glide from beginning to end. By now you get that I truly enjoy Natalie’s Estate wines. But there is more! Imagine getting many of these great wines from under $30! This is amazing to me because these wines are superior to many wines that are far more expensive. When I asked Boyd about this he will basically tell you that his winery is successful and he wants to give his customers a great wine at a great price. I belong to Natalie’s Estate’s wine club. Perhaps that doesn’t sound like a big deal but my wine budget has limits and I have to make choices about what clubs I join. 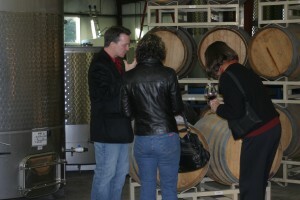 One of my requirements has always been that any wine club I join must have a tasting room with regular hours (i.e. I want to be able to visit on a whim). This is not the case with Natalie’s. I bought wine from Natalie’s for several years before I finally joined their club strictly adhering to my requirement. However over time I found myself simply enjoying being there. 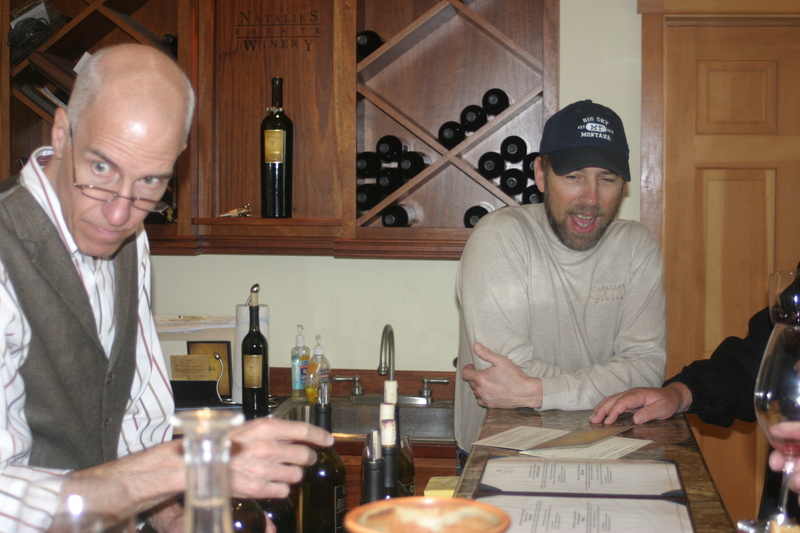 You will never visit Natalie’s and feel separated from the winemaker. In fact by the you conclude your first visit, assuming you are not one who actively avoids contact with people, you will feel as if Boyd is your good old friend. Boyd wants to pour you his wine. He wants to talk to you about his wine. He wants to make you feel at home. It is truly a unique winery environment. It is comfortable. I love taking family and friends to Natalie’s and I cannot recall a single instance where Boyd has not made it happen even when they were not scheduled to be open. 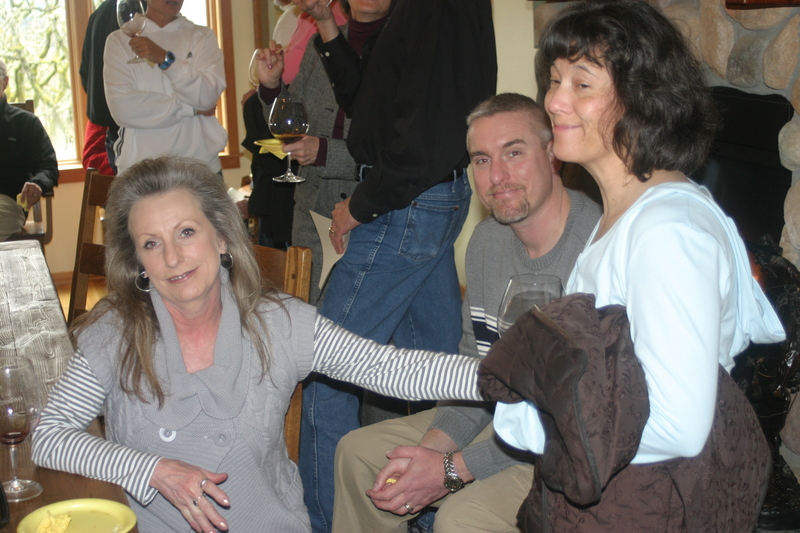 I remember one instance when my nephew was visiting from California and Boyd opened up the tasting room so he could try the wines. There was another club member there who had brought a bottle of pinot noir he had made as part of a class at the late Bishop Creek Winery. Not only did we taste Boyd’s wines but Boyd also poured this club member’s wine, showed how the wine improved by decanting, pulled a couple other pinots from his cellar that were of the same vintage (one I recall was a Laura Volkman) to educate this club member about that particular year’s pinot noirs (2007). My nephew and I got to come along for the ride. It was absolutely wonderful. Boyd was clearly in his element. I would be remiss to not mention Boyd’s wife Cassandra who perhaps has less up-front exposure but plays an important role in making the Natalie’s experience so good. We always have wonderful food pairings whenever the winery is open and she works tirelessly to make sure visitors are taken care of. Cassandra and Boyd are a great team who make Natalie’s Estate an enjoyable experience. P.S. Natalie’s has a Tempranillo in the barrel that is absolutely wonderful. If you love this Spanish wine as I do this is one you will not want to miss. 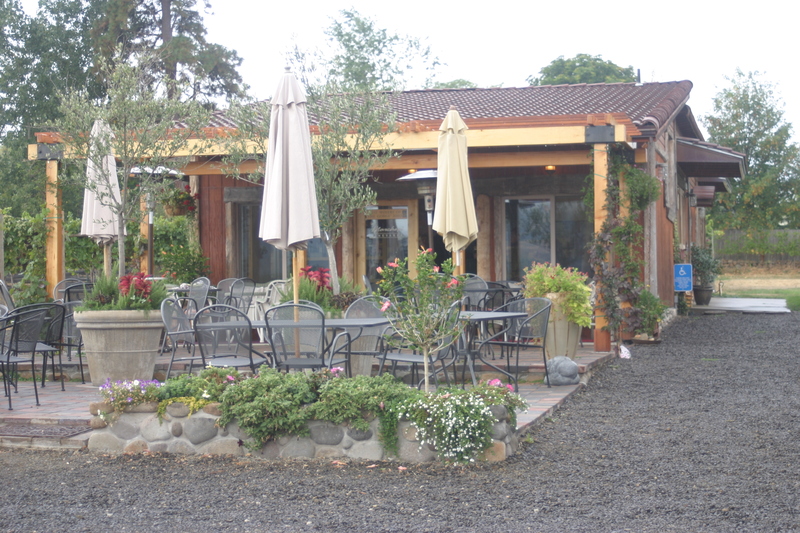 Estate/Wine By Joe located on the east side of Dundee, OR. I first visited Dobbes several years ago on the recommendation of my son Ryan who discovered them while applying for jobs. 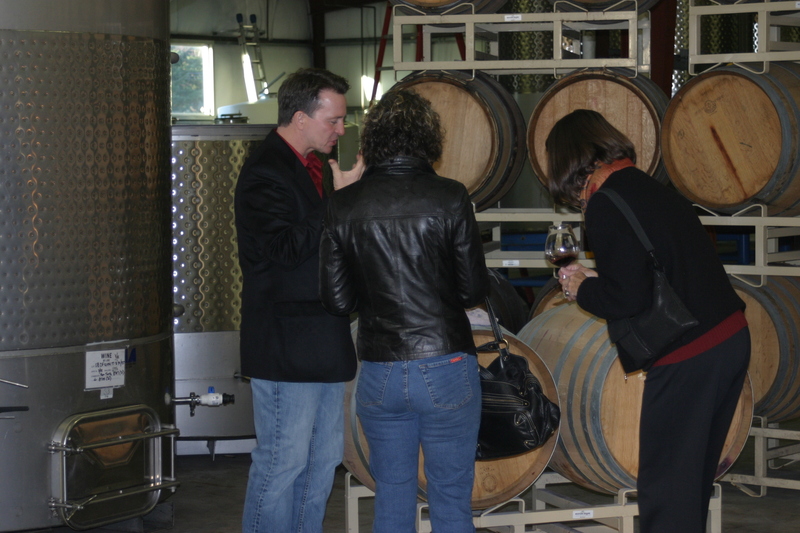 It was love at first taste, and after enjoying their wines for a number of years I have come to regard Joe Dobbes (winemaker and owner; shown offering barrel samples) as one of the premier winemakers in the Willamette Valley. Since I am partial to red wines we will start there. 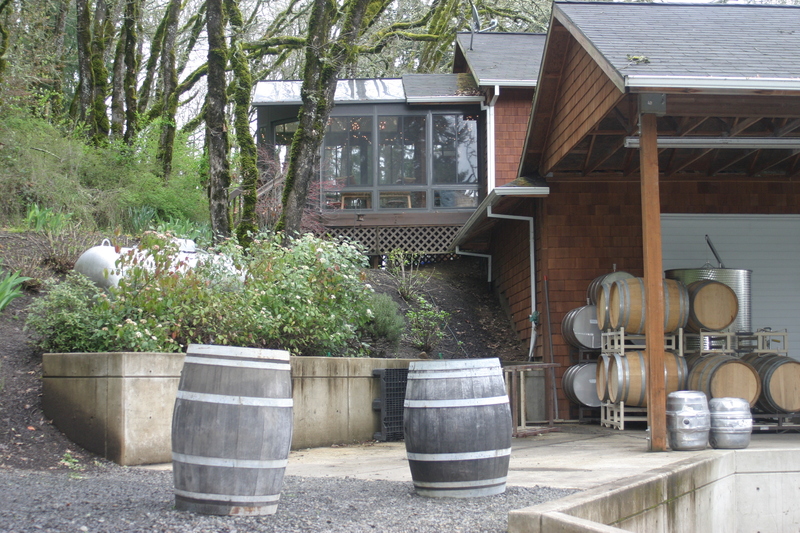 The staple wine here in the Willamette Valley is pinot noir and it is not uncommon for a winery to sell multiple pinots at a variety of price points. A problem that I see with many wineries is for whatever reason the flavor profile of the pinot noirs that they sell doesn’t seem to change much. It’s as if they have this vision of what a pinot ought to taste like and impose that on all their wines. This is not the case with Dobbes. 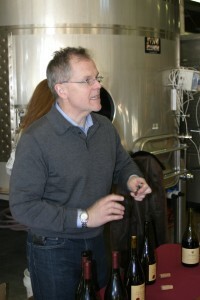 Joe Dobbes makes 10+ pinot noirs and they are all different ranging from the bright, light, joyful Skipper’s cuvee (actually made from Rogue Valley grapes), to the bold Griffin’s cuvee, a variety of vineyard designates (Quailhurst and Meyer have been my favorites of the years), to the most balanced flavored pinot noir I have every had Patricia’s cuvee. If you are looking for a wonderful everyday drinking pinot noir for under $20 the Wine-by-Joe Pinot Noir is the ticket. Joe Dobbes has also single handily made me a syrah lover. He makes three syrahs: Grand Assemblage, Fortmiller, and Sundown (club members only) all of which are wonderful. His syrahs are big and full flavored….just the ticket for those who enjoy a stark contrast to typical pinot noir in the valley. Of note is the GA syrah which for under $30 is incredible bang for the buck. Dobbes sells many more wines but one other that I want to mention is their viognier. Generally I am not a white wine drinker but this viognier is nice and dry (I’m not a fan of residual sugar in a viognier), complex in flavor, and simply a delight to drink. I find that the elimination of sweetness common to so many other viogniers allows the wine to stand on its innate character. 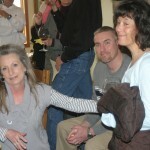 There are many other wines to enjoy and I encourage you to visit their tasting and try them. and more about fun and Dobbes has not disappointed. From winemaker’s dinners to BBQs outside the tasting room to picnics at their Larkins Estate vineyard. They even let us come in a be harvest interns a couple of times. Each and every event is an absolute blast. Best of all however is the atmosphere in the tasting room. Retail sales manager Charles Hesson creates a relaxed environment where you feel like you are tasting wine among friends. My wife, after experiencing Dobbes, said that it reminded her of the TV showCheers where everyone knew your name. Without a doubt I have found being a member of Dobbes wine club a holistic experience.